Plot has a build in programing interface which allow editing of three different types of programs. can be used to control nearly all function of Plot and automate complex tasks. because of the power of Perl this option makes it possible to import every sort of data. The interface is the same for all of them. It is possible to call the the perl programs from the Plot macro language. The big text field contain the macro itself. The small text field is the output console where messages or debug info can be printed. The list on the right contains a list of all your macros. 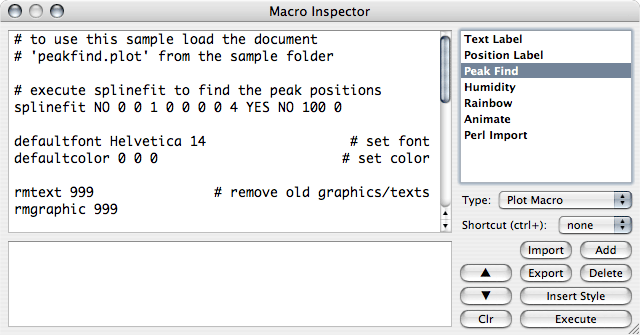 Type: Selects the type of your macro. Shortcuts: You can create an unlimited number of macros but only 26 keyboard shortcuts for macros. Up, Down: Moves the selected macro in the list up or down. Clr: This clears the console output. Import, Export: Allows to import or export the whole macro set and store it in a file for later use. Add: Create a new empty macro. Delete: Delete the currently selected macro. Execute: Executes the macro on the current document.